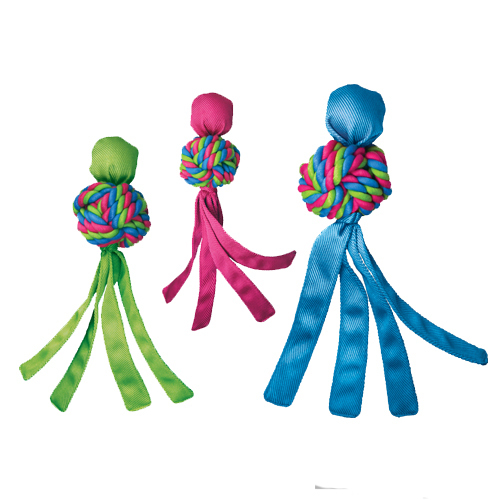 KONG Wubba Weaves is a fun dog toy made of knotted rope and a strong nylon tail. This toy is highly suitable for toss-and-tug games and provides hours of fun for both dog and owner. KONG Wubba is an incredibly fun dog toy, suitable for both indoor and outdoor games. The Wubba Weaves is made of a brightly coloured, knotted cotton ball of rope that helps clean your dog's teeth whilst playing. Just like the KONG Wubba, Wubba Weaves also has the signature nylon tail that makes it ideal for games of fetch and the squeaker will encourage even more playful behaviour! Available in three different sizes and colours (green, pink and blue). Please note: This product is part of an assortment, this means that it is not possible to choose the colour. Have you used KONG Wubba Weaves before? Let us know what you think about this product.